These are absolutely fantastic party fare, and always a big hit with both vegetarians and meat eaters (sorry vegans, but these do include dairy and eggs). Vegetarians particularly rejoice when you serve these up at your parties, especially those who grew up with party pies and sausage rolls as the ultimate party food. 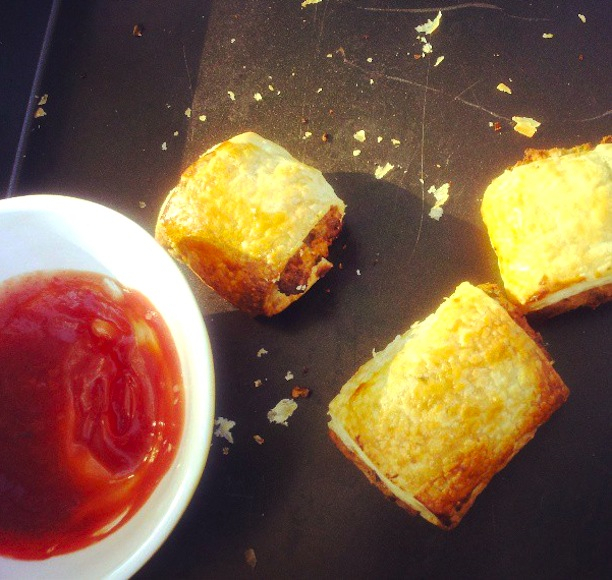 These sausage rolls taste almost exactly like the meat kind (except not as greasy): vegetarians can now get to indulge in the nostalgic party food of their youth with gay abandon. Unlike a lot of veggie rolls, these are in no way earnest or too healthy, which is always a good thing when you’re having a party – I don’t think grated carrot (or, god forbid, lentils!) 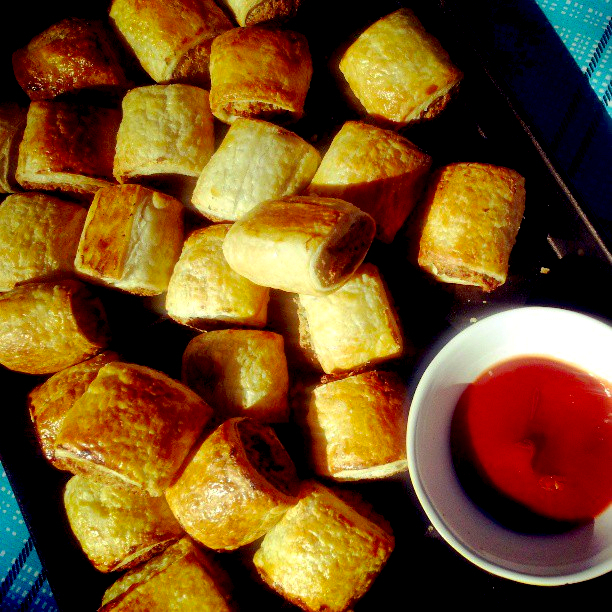 have any place in a party sausage roll. A word of warning: the raw mix of the filling looks kind of revolting (as the former German Chancellor, Otto von Bismark, once said, people should never know how laws and sausages are made). 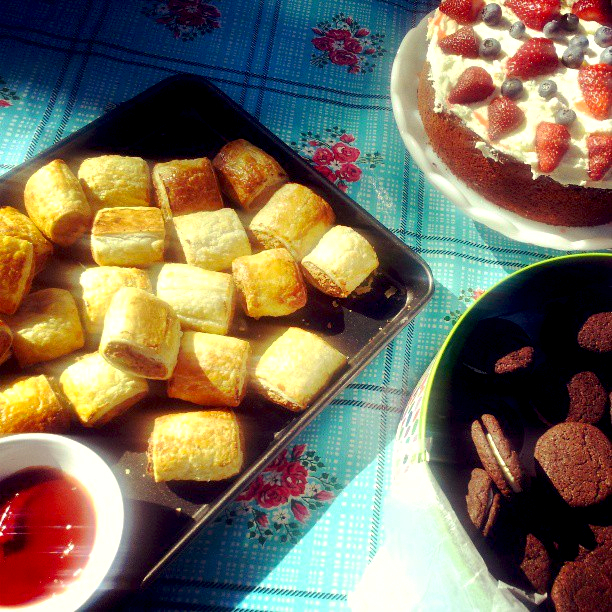 The first time I made these, I made a double batch of the filling to bake off the next day. When I put it in my fridge, it looked kind of like a large bowl of dog puke. I found this recipe from Stacey at Veggie Mama and while she had warned that the mix looked slightly off putting, I wasn’t really prepared for how much so. I went to bed that night and woke up at three o’clock in the morning in a cold sweat wondering what the hell I was going to do with the giant bowl of dog puke in my fridge. I should have had more faith, because they turned out brilliantly. When these rolls are baked, the ends magically turn brown and appetising looking, just like the party sausage rolls from your childhood, but even better! I guess the moral to this story is that sausage making, even of the vegetarian kind, is never a pretty sight. 2 tablespoons of grated Parmesan-style cheese. In a large bowl, mix together rolled oats, bread crumbs, seasoning and Parmesan. Process walnuts, parsley, eggs, cottage cheese, onion and soy sauce together and add to rolled oats mixture. Mix together until well incorporated. Pre-heat oven to 200°C (180°C fan-forced). Cut pastry sheets in half and mound a layer of sausage mix down the centre. Roll up sheets and seal with egg wash.
Cut each roll into five pieces, place on baking tray with seamed side down, brush with egg wash and bake for 30 minutes or until golden. These are actually the best ‘sausage’ rolls I’ve ever eaten. I’m pretty sure that if you didn’t tell anyone that there was no meat to found anywhere near these ‘sausage’ rolls, they wouldn’t even realise it. I know, it’s sad that vegetarian food has to taste like meat for many people to consider it any good, but I am mightily impressed. TOP STUFF. Please tell me how you veganise them. Tofu instead of the cottage cheese is an obvious substitute but I think they may need some finely chopped fried mushrooms to amp up the flavour and something to replace the egg to bind it all together. Definitely need to try these they sound so good!